I bet you all did not know that January is National Soup Month. Well, instead of showing you a cozy, pre-1900s depiction of a cute rural child eating soup, or one Warhol’s endless depictions of Campbell’s Soup cans, I thought I would show you a different kind of soup. It’s interesting because it’s part of a genre of art that few people ever pay attention to, but one that is seminal to contemporary satire, newspaper cartoons, even New Yorker Magazine cartoons: the political cartoon. The political cartoon evolved during the mid- to late-1700s in Western Europe, and quickly spread to America during the American Revolution (1775–1787). It was used for a variety of reasons: to mock the entrenched aristocracies of Western Europe, to parody fashion and social trends in rather cruel manners, and to address social problems in a humorous manner (although there was always a hint at criticism of government). 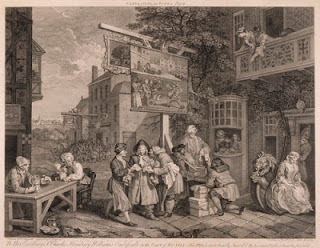 It is generally acknowledged that the heyday of British satirical art began with William Hogarth in the mid-1700s and ended in the mid-1830s when Victoria took the throne with her stifling morality (she would not allow women in her court to wear hoop skirts because the ankles showed when they tipped). We see a much longer life for the genre in France in the work of artists such as Honoré Daumier (1808–1879). This cartoon by William Heath falls into the “social problems” category. 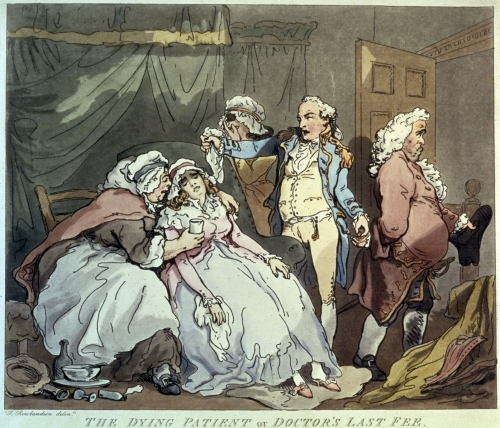 By the 1830s, London had one of its first major outbreaks of cholera due to the dumping of sewage (i.e. garbage, chamber pots, etc) into the Thames River. Typical of politicians, the British parliament did not act on sewer construction until 1858, the year of the “Great Stink” (when the stench of Thames water reached their noses in the Parliament building), and they hired architect Joseph Bazalgette (1819–1891) to design 5 major sewers to “save” London. Cholera was also a major problem in the US through the 1870s. This image shows a London matron examining Thames water through (presumably) a microscope. 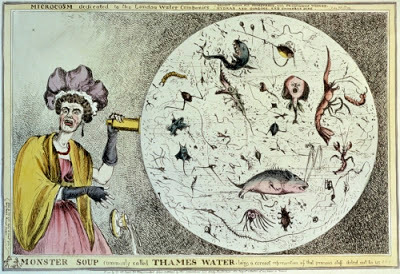 An Anglican London cleric declared that “He who drinks a tumbler of London Water has literally in his stomach more animated beings than there are Men, Women and Children on the face of the Globe.” Thus, monster SOUP. William Heath’s training is not known. 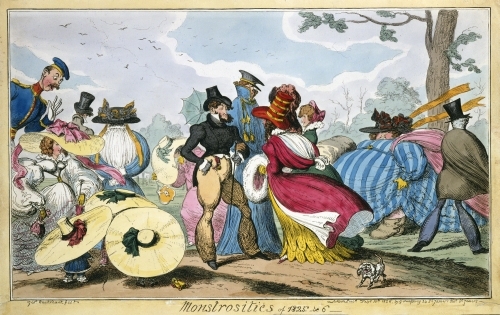 Until 1820 he specialized in satirical prints of military subjects. After that he turned almost exclusively to satirical prints about society and politics. Some of the most humorous subjects of manners, morals, and fashion were etched personally by Heath. Studio activity: A cartoon depicting a current ecological problem: Using fine tipped markers, and colored pencils or color markers, create a cartoon that satirizes (makes fun of or mocks) a contemporary environmental problem. Choose from climate change, rainforest depletion, frakking for natural gas, massive oil spills, etc. Make sure to include text or dialogue that makes clear what the subject of the cartoon is, and be sure to make it humorous rather than deadly serious.